Enter the 1995 Plus 6! June was a big month as I had the opportunity to buy the body and other parts from a 2013 Roadster that had been declared a statutory write-off (meaning it could not be registered again). The parts from this wreck will find a home on my Project Phoenix car, including the body, easy up mohair hood and side curtains, fuel tank, dashboard, aircon, wiring loom and 6 speed gearbox. The 3.7 V6 has external crankcase and timing cover damage so I intend to buy new parts to rebuild the engine as that will allow me to use the car’s ECU, fuel delivery system and other related parts. The body has only minor dents and despite the impact of the accident, only two pieces of timber are damaged. Remarkable! This is a marvellous boost to Project Phoenix as I was just about to start making a body from scratch ( I had even bought a band saw to make the frame). I guess the car will now become a 1995 Plus 6! With other projects needing attention Project Phoenix slowed a bit last year but I have still managed to do a few things. 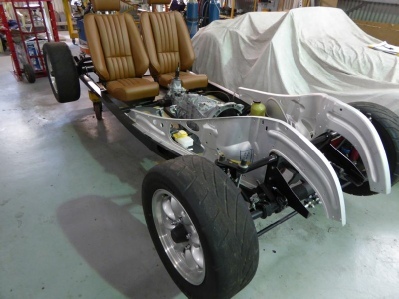 This pic shows current status with floors loosely in place, pedals and brake booster in place and electro-hydraulic steering rack now installed. I will be doing a full write up on the steering rack installation shortly. 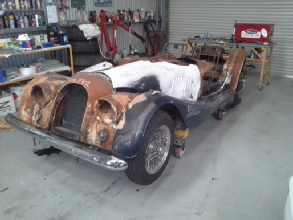 Early in 2013 I prepared a beautiful little 1.8 Zetec powered 1995 Morgan 4/4 in readiness for a 20,000 km trip around Australia by friends of ours. They were part of the Mozzie Tour organised by the Morgan Owners Club of Australia. The car completed the trip and my friends had great fun. Trip of a lifetime. 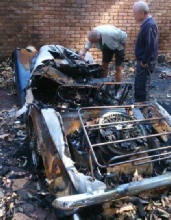 In October 2013, tragedy struck when their house and two cars were destroyed by fire. I have since purchased the burnt out wreck of the 4/4 from the insurance company and I plan to rebuild her on the basis that Morgans should never die. I hope you agree. On this page I will be informing you of latest progress.